Getting takeaways all the time can certainly burn a hole in your pocket. So making grilled cheese sandwich for dinner is my attempt to save some money to compensate my previous splurge on takeaways. Also I need a quick way to use up a loaf of stale french bread which originally intended for some fancy bruschettas. Anyway, since the bread became dry and harden as a result of leaving in the fridge for a tad too long, I thought making french toast would be a great way to soften the bread. 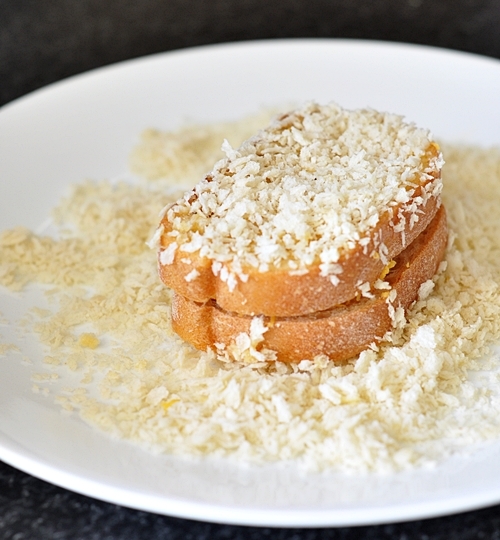 Since I have a weakness of everything crunchy, I immediately thought of the french toast with panko recipe found here. Maybe my exhaustion from work has made my brain gone haywired, I’ve decided to combine grilled cheese sandwich with panko breaded french toast all in one. Yeah, it sounds super greasy, and therefore the tomato factor, just so I can convince myself there’s some ‘health’ benefit with my money-saving dinner. I do realise grilled cheese sandwich is not exactly a proper meal calibre but when there’s time constraint or supplies run low in the fridge and pantry, it may just be the next best thing to a fulfilling hot meal. 1. Whisk egg, milk, salt and pepper in a shallow bowl. Set aside. 2. Pour panko breadcrumbs and grated cheese on respective plates. Set aside. 3. 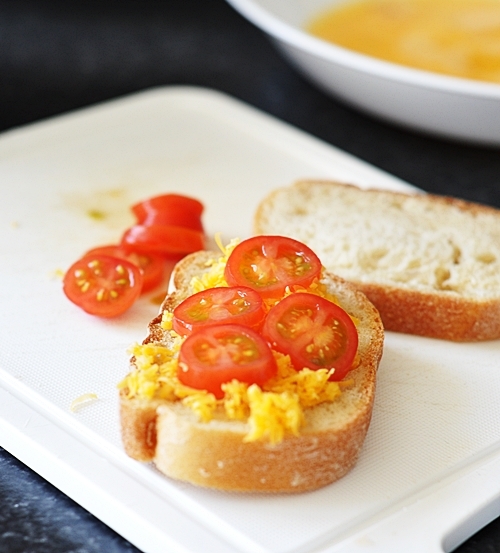 Add some grated cheese on a slice of bread, then layer with sliced tomatoes, then some cheese again and a second slice of bread. 4. Dip both sides of the cheese sandwich in the egg mixture and coat it with panko breadcrumbs. Shake of the excess breadcrumbs. 5. In a heated pan greased with some neutral cooking oil, grill both sides of the sandwich until golden brown. Keep the flame on low as we need to ensure the cheese is melted at the same time not burning the breadcrumbs. 6. Repeat step 2 and 3 for the remaining 6 slices of bread, cheese, milk and breadcrumbs. I think this looks GREAT! I may cook up a storm on the weekends, but fast and yummy are two of my buzzwords during the work week :D!! I have everything except tomatoes to make the, but do have some nice ham. Think I’ll give this a whirl one night next week. Ingenious… panko for that extra crunch. I bet these are so delicious, I HAVE to try this!!! I was just thinking about you and where you were Emily! This is clever and comforting. I like panko on everything seriously. you should try it with Lay’s regular potato chips instead of panko. the salty from the chips really beings the flavor up to a new level while keep the crunchy. wow this is something I can easy make in my small kitchen, excellent! What a delicious twist on a grilled cheese sandwich. Great texture and crunch. What a fantastic idea! I can just imagine the crunch of this crust. Grilled cheese sandwiches are definitely one of my favorite foods ever. I love your take on it! Those. Look. Amazing. You have combined all of my favorite stuff into one perfect food. Looks like a delicious case of decadence and imagination! 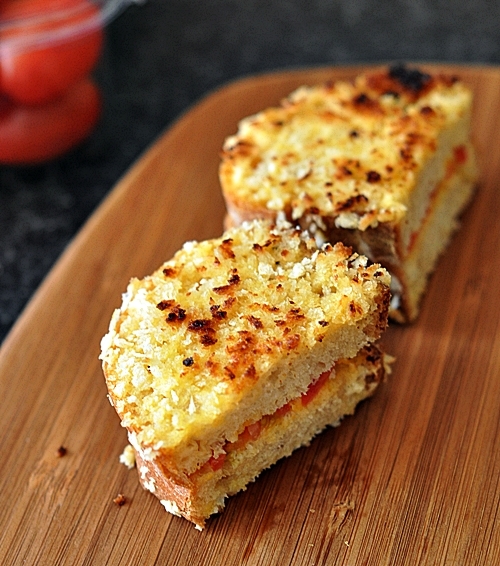 Never would’ve thought of adding a panko crust to french toast, but it looks really yum! This looks great! Thanks, can’t wait to try it! I remember when I was kid, I would eat grilled cheese sandwiches at least 3 times a week! Haha! Thanks for sharing your recipe! It looks delicious. 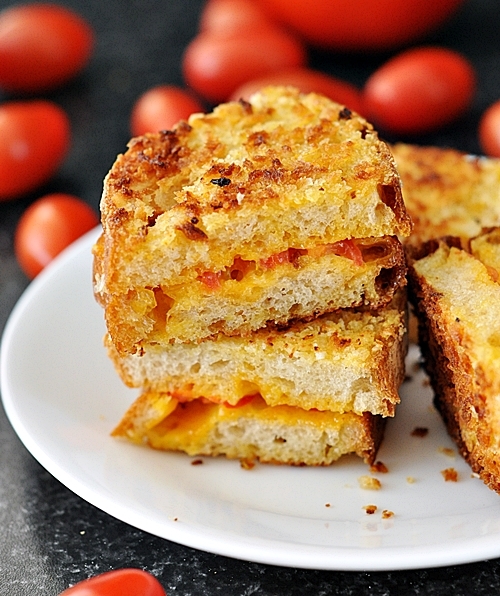 Now, I’m all about this Italian Grilled Cheese and Tomato. Hope you enjoy it too! I had grilled cheese for lunch today and it didn’t look nearly as good as this! Yum! great idea! It looks fantastic. I might add some parmesan to the panko bread crumbs and see how that works. Oh wow, great idea, bet that tasted fabulous! I am so craving this right now (and it’s only 9:15am here in Sao Paulo). Give me anything with tomato and cheese and I am a happy girl – and that crust is the perfect finish! Beautiful! 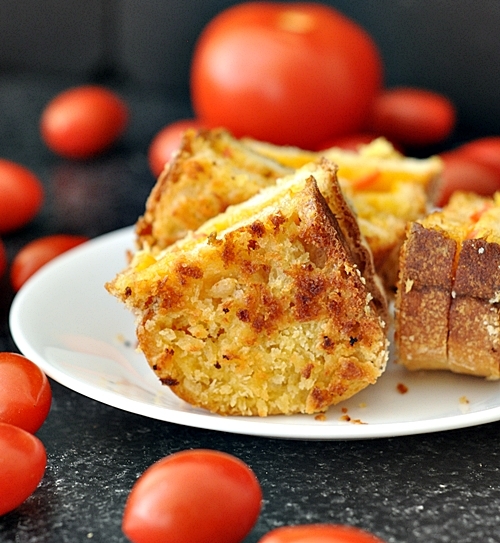 What a creative twist on the classic grilled cheese! My grandson would love this. Oh, heck, I’d love this! Oh Geeze, that looks good! These would be inhaled at my house!! Great idea!! I make grill cheese sandwich very often but have never once thought of doing something like this! What a great idea!